You could have saved yourself a lot of time last night on your bogus university story if you had just gone to HEDD and looked up the American University of London. In a matter of seconds you would have seen that it is not a valid UK degree-awarding body. Passing on to viewers the valuable information that you can look up all valid UK degree- awarding bodies, past and present on HEDD would have been helpful too – particularly to the individuals on social networking sites proudly citing their AUOL qualifications. According to the BBC coverage today, at least one of them has had a rethink and removed it from his CV. I wonder how many others have also done so? Earlier this week we discussed Dennis O’Riordan and whether he will be prosecuted. I’m glad to say that the Church appears to take a dimmer view of this crime than the Bar with the successful prosecution of Maximilian Manin last month. Mr Manin confessed his criminal past to the Bishop of Lincoln, who in the spirit of Christan forgiveness allowed him to keep his job of Chief Executive for the Diocese, but failed to mention that he had lied about having a first class degree from the University of Sheffield and an MBA in order to obtain the position in the first place. With high profile examples like these hitting the headlines, perhaps we will see a step change in recruitment practices and more checks being made. It’s good to know that the Bar metes out justice to members breaking its code; like Barrister Dennis ‘Tom’ O’Riordan who committed degree fraud in the most spectacular fashion and was found out. The full outcome of his tribunal before the Bar Tribunals and Disciplinary Service is here. Suspicions were raised because he claimed to be an Eldon Scholar from the same year as one of the partners in the chambers to which he was applying. He was subsequently outed on legal news and gossip site RollonFriday. He’s been suspended for 3 years. Let’s hope that with their inside knowledge of the law, they will also push for criminal proceedings against him under the Fraud Act. Bachelor of Arts (First Class) Oxford University. All completely untrue or embellished. He did study Law at East Anglia – but didn’t get a First. The pity of it is that he appears to have been an extremely competent litigator, well-liked and respected with a proven track record. He was a legitimate member of the Bar with his real qualifications. He worked for a top firm with an excellent reputation, who must now be counting the cost to their brand and reputation in large multiples of billable hours. They have so far declined to comment on their recruitment practices, but I suspect they will be currently under review. I’m bemused by the subsequent reaction in the legal media to the case above. His employers have defended themselves saying that they recruit on reputation, not qualifications, and would not check up on senior hires. They argue that his competency is the most important factor and that he was a genuinely qualified barrister who gave a high quality service to clients. Here’s an analogy that might make them rethink their views. Essentially we’re talking about counterfeit goods. If I buy a Hermès handbag, I want it to be Hermès, not a George at Asda lookalike*. Yes, the lookalike is a perfectly good quality handbag and fulfils its function, but I thought I was getting Hermès, and that’s what I paid for. In those terms, wouldn’t we all be straight down to Trading Standards to complain? *George is a fantastic brand in its own right, but a supermarket own-brand nevertheless. Posted on October 14, 2013 October 17, 2013 Author Jayne RowleyCategories Six Degrees of FabricationTags degree fraud, fraud2 Comments on You’re Barred! There are over 3700 registered users on HEDD now and 12 university operators so we’ve been doing some user testing to find out exactly what customers are using HEDD for and how we could improve the services. 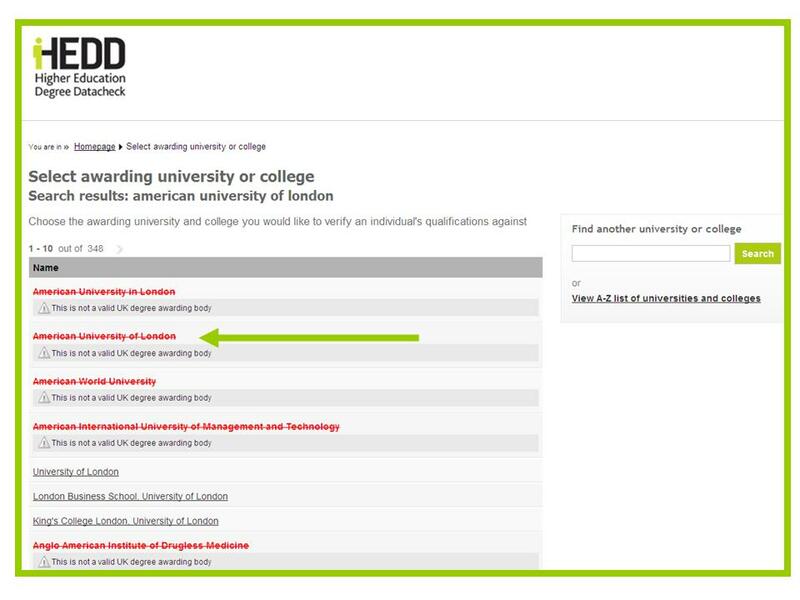 The university look up service is popular and well-used – nearly a quarter of the enquirers come to the site to check the validity of universities and to get details of their verification protocols. Nearly all the universities have directly engaged with this and many keep their own details up to date. This service is unique to HEDD and is valued highly by visitors. We are going to extend this service later this year to include the Higher Education Colleges delivering degree programmes validated by other universities. 65% of customers come to HEDD to use the verification service to check qualifications. As it’s the core service we were not surprised and as the number of participating universities grows, we think this number will increase. We were a little surprised that checking degree classification was the reason for only 29% of enquirers. On further investigation it seems that many enquirers are happy that candidates are confirmed as having a degree and don’t care about the details. Over a third use HEDD to check attendance dates. This was not in our original brief, but has been introduced due to the high demand. Screening agencies in particular are keen to match the dates – especially as part of a wider background check to look for gaps in timelines on CVs. And it’s not just about graduates either. 10% of the enquiries are about current students enrolled in our universities. For council tax exemptions, discounted travel cards etc. confirming that students are enrolled and for which dates is essential. Nearly half of all our enquirers are overseas and they love HEDD. They are mainly checking international students returning home to employment. The fact that it is a 24/7 online service is proving vital across global time zones. There also seems to be a better developed culture overseas for verification as evidenced by the National Student Clearinghouse in the States. 3,500 US universities and colleges are in, representing 98% of their students and graduates. This is a great motivator for our HEDD team as we strive to expand the service in the UK. The US are not alone either, there are central verification services in many other countries. We’ll be looking to link to them from HEDD so enquirers can check qualifications across the globe from our central portal.